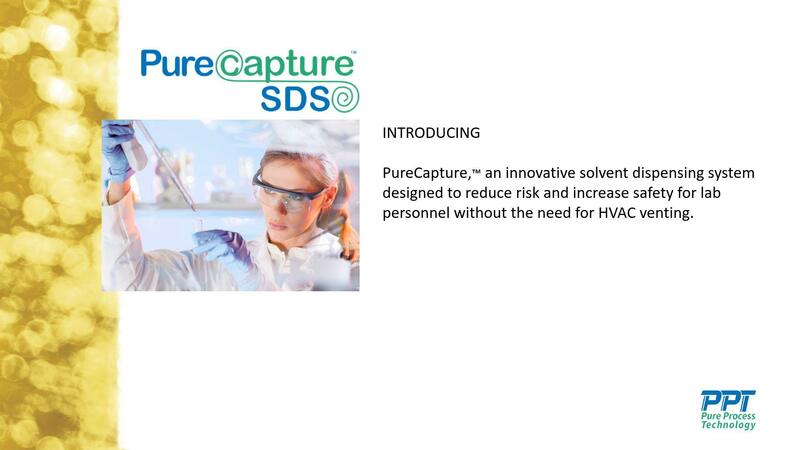 Through the collaborative efforts of Pure Process Technology with their expertise in successfully designing and manufacturing high-quality solvent dispensing systems and Erlab, an international leader in the field of filtered laboratory safety enclosures, comes PureCapture™, an innovative solvent dispensing system designed to reduce risk and increase safety for lab personnel without the need for HVAC venting. This quality engineered product offers safe solvent dispensing in a reliable, duct-free package. Integrated with SMART® technology, performance of the product is constantly measured, providing communication by mean of SMART light, audible and Eguard a web-based communication platform. 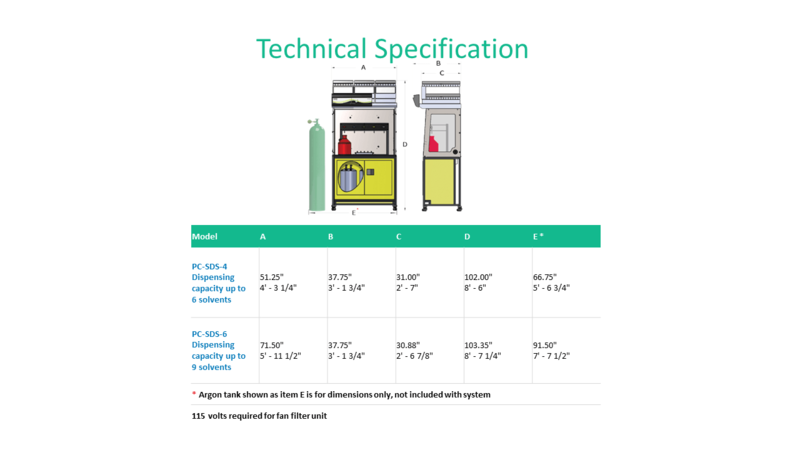 In comparison to other filters, Erlab filters average change cycle will be every other year, depending on use, and are extremely easy to replace. 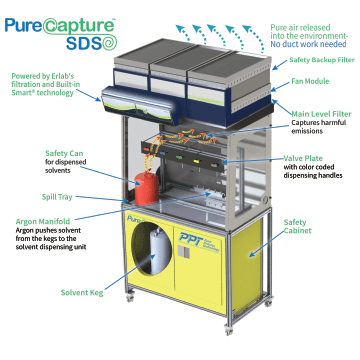 Our Solvent Dispensing Systems are ideal for environments when multiple users are dispatching solvents on a regular basis. We continue to provide our legacy systems for lab managers, who are obliged by protocol, to purchase the more traditional systems. 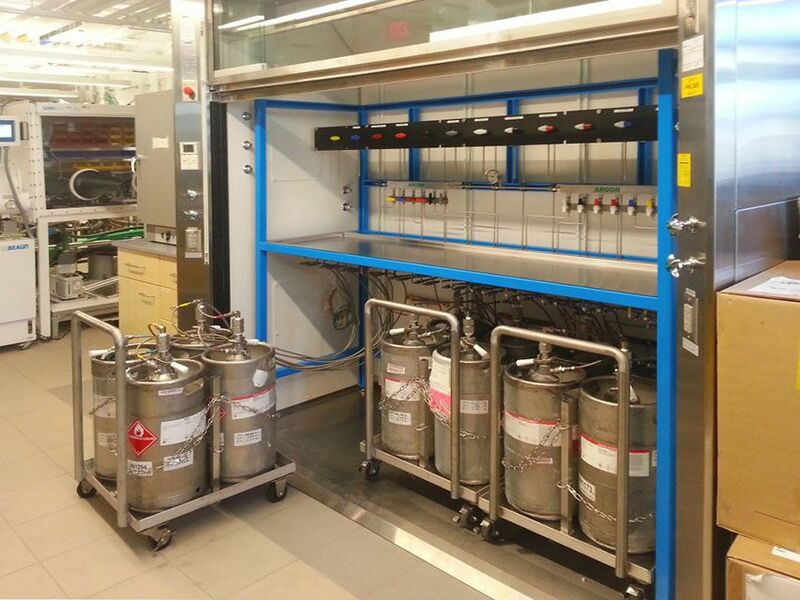 These systems enable users to dispense general solvents in the lab in a safe and efficient manner but require venting.